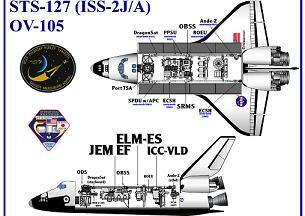 STS-127 has been scrubbed for the second time due to another leak at the Ground Umbilical Carrier Plate (GUCP). The leak, first registered as within an acceptable range, before rising to breach the four percent (40,000PPM) limits, appears to point to a different issue with the hydrogen vent system. Endeavour will now have to wait until NET (No Earlier Than) July 11 for launch. No issues were reported to the L-1 (day) Mission Management Team (MMT) meeting on Tuesday morning, as work was completed on the GUCP Quick Disconnect (QD) and seal replacement work, following successful leak checks just a few hours ahead of the debrief. The retraction of the Rotating Service Structure (RSS) began at 10:15am EDT, ahead of the LH2/LO2 tanking, scheduled for 20:15 EDT.” However, tanking was delayed due to poor weather passing over KSC. The Mission Evaluation Room (MER) at the Johnson Space Center (JSC) reported no issues of note during the day, bar only one minor issue relating to a communication issue, which was soon closed. All eyes were on the leak detectors during tanking, following the scrub of the opening launch attempt on Saturday. An investigation team is working on the root cause of the leak, although confidence was high the replacement seal – which was cherry picked out of a batch of six available spares – would perform as required. Confidence in a successful tanking was aided by a similar event during STS-119’s opening launch attempt – followed by the successful tanking after the seal was replaced at the pad. 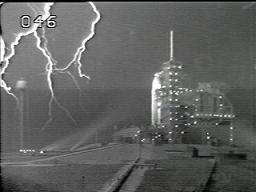 The MMT gave the go for tanking operations near to the latest possible point in the countdown, as unacceptable weather in the area – which included two lightning “events” noted at Pad 39B and 39A – delayed tanking by nearly three hours. Once tanking had begun, KSC managers started to work out a new timeline for the remainder of the count, before another leak was detected in the GUCP. This leak was initially recorded as far less than the 80,000ppm (8 percent) registered ahead of the scrub of the opening launch attempt, with the leak during this tanking being noted as initially up to 13,000PPM (1.3) – which is below the allowable leak concentration of 44,000PPM. Later information noted spikes of 6,000 and 10,000 PPM. However, the leak – which was seen 25 minutes prior to topping – appeared to increase at the end of fastfill operations, with a register “well above” the 40,000PPM limit – noted by sources as high as 60,000PPM (6 percent). Due that break of the Launch Commit Criteria (LCC) – and the potential that there may be problems other than a seal misalignment – managers made the prudent call to scrub the launch attempt. More will follow – refer to the live update pages for live coverage. Article coverage will be forthcoming throughout the investigation. “The JEM Exposed Facility (JEF) will be installed on Flight Day 4. 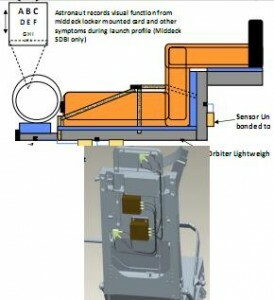 The JEM support experiments are directly exposed to the space environment. “There are no payloads berthed on the JEF at the time of the JEF install,” noted the mission walkthrough presentation (L2). “The payloads will be transferred from the exposed section (JLE) to the JEF later in the mission (FD09). Post JEF install, the EFUs (Exposed Facility Unit) will be checked out from the ground to ensure the JLE can be safely installed. 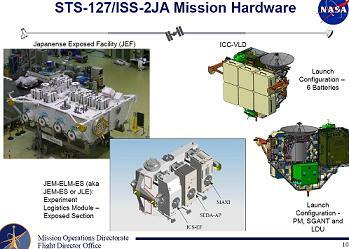 “The JEM Experiment Logistics Module-Exposed Section (JLE) will be installed on FD7. “The JLE carries-up 3 exposed payloads and returns in the PLB (Payload Bay) empty after the payloads are transferred to the JEF. All payload transfers must be completed before the JLE is returned to the PLB on FD11. “The three JAXA Payloads that will be installed on the JEF via the JEMRMS are: Inter-orbit Communication System-Exposed Facility subsystem (ICS-EF): Communicates with the TDRS Network for downlink of telemetry to JAXA. Also involved with Endeavour’s STS-127 mission are several DTOs (Detailed Test Objectives), which include another Thrust Oscillation Seat on behalf of the Orbiter Project Office (OPO) at JSC. “The OPO is implementing a DTO to assist in the development of unimpeded crew performance specifications,” added documentation (L2). “Testing was done during the Gemini program to determine acceleration and frequency acceptability for crew performance. This was never validated with flight data. “This DTO will gather vibration data on crewmember seats during launch. The DTO may be done in conjunction with Short Duration Bioastronautics Investigation (SDBI) that will qualitatively measure middeck crew performance. “Prior to flight, the accelerometers and sensor box mounting plate will be bonded to the vehicle seat and the cabling will be routed and secured to the seat. “The accelerometer cable and sensor box (with new flight battery) will be tethered to a screw on the seat via a metal lanyard as a secondary retention method. All installation will be documented on the Crew Compartment Configuration Drawing (CCCD). It was initially classed as a data point experiment for efforts to mitigate Thrust Oscillation issues with the Ares I launch vehicle. However, the shuttle program insist the DTO is relevant to required data that has been long awaiting approval. process. However, one DTO that is looking into the post-shuttle era is the DragonEye Flash LIDAR DTO relating to SpaceX’s Dragon capsule. The primary objective is to provide a risk reduction for Dragon Demonstration Flight C3 (which berths to the ISS) by performing a full demonstration of the flash LIDAR in the space environment using the ISS as a target, which will allow for the performance of sensor to be compared with the known Trajectory Control Sensor (TCS). 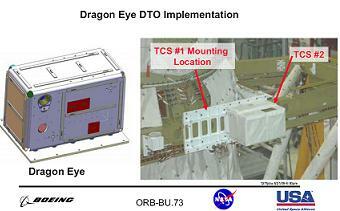 The DragonEye DTO will be mounted to the Trajectory Control System-1 (TCS-1) carrier assembly on Endeavour’s ODS starboard location. TCS-2 is mounted to the port location. Other DTO relates to the Shuttle RSRB Chamber Pressure, Strain Gauge, and Acceleration Rates Data Collection requirements, while a “DTO of opportunity” has been added to the flight, noted as DTO 805 Crosswind Landing Performance. The purpose of this DTO is to demonstrate the capability to perform a manually controlled landing in the presence of a crosswind – providing there are crosswinds when Endeavour lands at the end of her mission. As with most flights, additional payloads will ride with the orbiter, which allow for experiments to be carried out during the mission. Below is the list of these payloads. “Maui Analysis of Upper atmospheric Injections (MAUI): The objective of the MAUI payload is to obtain optical signatures of spacecraft plumes using the optical telescope sensors and all-sky images at the Air Force Maui Optical and Supercomputing Site (AMOS). “The MAUI payload will require state vector information and may request OMS, Primary Reaction control System (PRCS) and Vernier Reaction Control System (VRCS) burns, if propellant and crew time are available. “The MAUI payload may collect data during any encounter opportunity when the Orbiter support activities can be planned to meet the criteria defined. This payload desires PLB lights turned off from15 minutes prior thru 5 minutes after experiment. “MAUI may request dedicated OMS, (Primary Reaction Control System) (PRCS) and Vernier Reaction Control System (VRCS) burns, if propellant and crew time are available. State vectors are also required.